The 2019 FACT/SF Summer Dance Lab (SDL) is designed for dancers new to Countertechnique and for those who have already had some experience with the practice. Within an open, investigative environment, participants will spend 7 days learning and experimenting with Countertechnique tools and information to heighten awareness, distill intention, have fun, get sweaty, and explore unknown terrain. The Dance Lab is intentionally inclusive and non-competitive. Co-taught by Countertechnique Teachers Charles Slender-White and Joy Davis, the SDL offers daily Countertechnique class coupled with a close examination of Countertechnique tools, principles, and applications. Participants will deepen their understanding and use of Countertechnique and have ample time to engage in conversations about the practice. In addition to Countertechnique class and Deep Dive modules, the SDL includes sessions on applied anatomy, improvisation, and FACT/SF Repertory as points of departure for inquiry, discovery, and discussion. 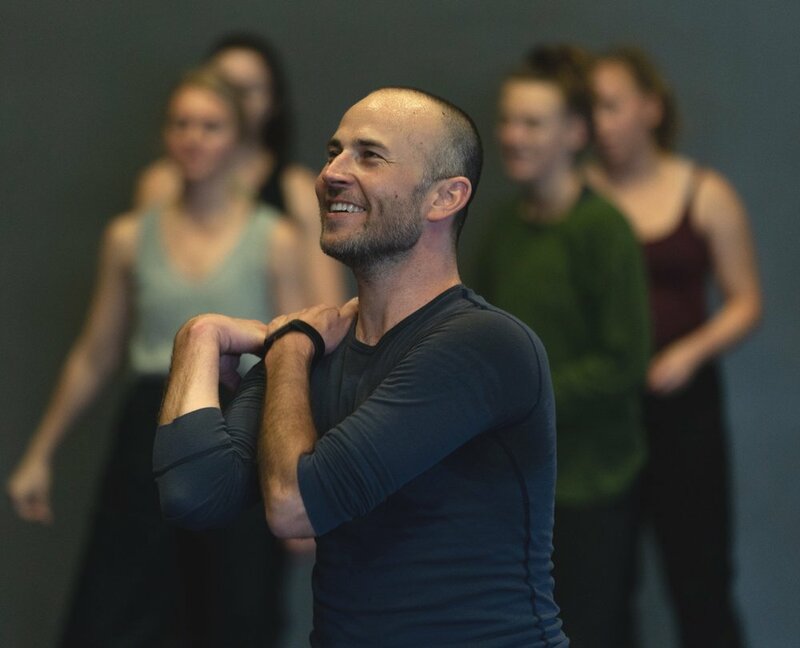 The Dance Lab will also feature a section on professional development, Working Better for Better Work, led by FACT/SF’s Artistic Director, Charles Slender-White. The 2019 SDL will accept a maximum of 20 participants. The FACT/SF Summer Dance Lab is designed for curious advanced and professional dancers. We are warm and open to you as a participant, and we want to learn more! Why are you interested in the Dance Lab? What role does dance currently play in your life? What past experiences have you had that inform your current dance practice? If applicable, please also share with us your past experiences of Countertechnique and information about how Countertechnique informs your current dance practice. Within two weeks of applying, applicants will be contacted by FACT/SF regarding their participation in the Dance Lab. Applicants are accepted on a rolling basis until the Dance Lab has reached capacity. Once applicants have been accepted into the Dance Lab, they will need to pay a $150 Security Deposit to reserve their spot. Remaining tuitions are due by Wednesday, June 26, 2019. Once notified of acceptance and successful processing of full tuition, participants will receive a Welcome Packet. Information will include: area attractions, directions, public transportation, parking, Dance Lab Detailed Schedule, and supplemental information on Countertechnique, FACT/SF Repertory, Working Better for Better Work, and more. By continuously and sequentially directing and counter directing parts of the body through space, Countertechnique allows the moving dancer to work with an ever-changing dynamic balance. This dynamic balance reduces the pressure on the overall body structure and can be changed at any given moment. The consistent use of the counter direction in all movements is key to the technique; both the awareness and application of this principle is trained throughout the Countertechnique class. The Countertechnique theory is orga­nized around two principal notions: the ‘toolbox’ and ‘scanning’. The toolbox is the systematically organized collection of tools for body and mind with which Countertechnique works, often visualized as a virtual map that dancers carry with them. Scanning defines the process of dancers continuously and actively observing their mindset and body in order to choose the most appropriate tool(s) from the toolbox for the situation they find themselves in. Scanning allows dan­cers to make active use of the toolbox in their daily practice of training, rehearsing and performing. Countertechnique was developed by Anouk van Dijk throughout her twenty-five year career as a dancer, choreographer and teacher. Over the last fifteen years, the knowledge and experience she gained – in constant dialogue with her dancers – was gradually transformed into a detailed theoretical system and a teaching method, which now together form the Countertechnique system. In the 2019 FACT/SF Summer Dance Lab, Countertechnique will be co-taught by Joy Davis and Charles Slender-White. Throughout the SDL, Davis and Slender-White will lead the group in a series of playful and investigative improvisation sessions. These sessions will be opportunities for dancers to utilize Countertechnique tools for instant composition within a group performance context, and will be informed by Davis’ and Slender-White’s diverse experiences as performers and choreographers. An underlying question throughout these sessions will be: how might we include our whole selves for movement invention and choreographic creation? Over the past ten years, FACT/SF has established itself in the SF Bay Area with a unique blend of technical precision, intellectual rigor, and emotional expressivity. Working with sections from FACT/SF’s work, death, participants will learn complex phrase work, experiment with improvisation skills, and learn how to utilize Countertechnique tools in the context of choreography. In 2018, death was selected by the San Francisco Examiner as one of the top dance events in the Bay that year. death touches on the relationships the living have with the dead, and is both an examination of and treatise on mourning and grief. The repertory sessions in the SDL will give participants an opportunity to utilize improvisation skills in making in-the-moment compositional choices. We will additionally play with the use of Countertechnique Tools during live performance and will specifically examine how popping, double presence, seeing, and dynamic balance can be applied while executing set choreography. Working Better for Better Work: Tips on Being a Pro focuses on the logistical and administrative necessities for working effectively and equitably within the dance field. The session will cover basic strategies for presenting oneself in a professional manner, building a community and a network, maintaining and developing relationships, and articulating and pursuing artistic and professional aspirations. After over a decade in the field, Charles Slender-White has witnessed a great number of dance artists unintentionally misrepresent themselves. With helpful tips and candid discussion, we’ll work collectively to identify how we can consistently put our best foot forward. If requested, Slender-White will additionally give feedback on participants’ CVs. Joy Davis a dance artist and educator steeped in the practices of Countertechnique and improvisation. She began studying Countertechnique with founder Anouk van Dijk in 2005 and became one of four Americans certified as Teachers in 2012. She teaches all over the US including workshops at Gibney Dance, Seattle Festival of Dance Improvisation, Lion's Jaw Dance + Performance Festival in Boston, and the American Dance Festival. Her initiative, joyproject, produces collaborative dance theater performance which evokes contemplation, humor, and elegant design since 2006. She was a Chicago Dancemakers Forum Greenhouse Artist, Choreographic Resident at the Workspace for Choreographers, Choreographer's Lab Artist with New Dialect (Nashville), NeXt Choreographer for Urbanity Dance (Boston), and recently awarded the Next Steps grant from the Boston Foundation. She currently collaborates with Mountain Empire Dance Collective, School for Contemporary Dance and Thought, and Alexander Davis Dance. Joy and Alex (The Davis Sisters) were recently awarded a 2018 Schoenberg (Boston) Fellowship residency at The Yard to develop and perform a new work; and were currently named the inaugural Choreography Residency recipients at Boston’s Museum of Fine Arts. Joy received an MFA in Choreography and Performance from Smith College, and has since taught as visiting faculty at Smith College, Wesleyan University, and Harvard University. Joy is an associate professor of dance at Boston Conservatory at Berklee. Charles has been a Countertechnique practitioner for 14 years, and became a Certified Teacher in 2012; there are 32 Teachers worldwide. Charles has taught Countertechnique at the University of Calgary, Loyola Marymount University (Los Angeles), the University of San Francisco, CSU East Bay, L’Artere (Quebec City), Circuit-Est (Montreal), Love-In (Toronto), Chunky Move (Melbourne), and at numerous dance centers throughout the SF Bay Area. He began his dance career in 2006 with Tatiana Baganova’s Provincial Dances Theatre in Yekaterinburg, Russia. In 2008, he returned to his native California to start FACT/SF in order to make his own contributions to innovation and excellence in contemporary dance. Over the past 10 years, Charles has created 34 works, with commissions by the US Department of State, CounterPulse, Acid Rain (Chelyabinsk), Dialogue Dance (Kostroma), the Yekaterinburg University of the Humanities (Yekaterinburg), and others. Described as ‘utterly absorbing’ and ‘mesmerizing’ (SF Bay Guardian), Charles’ work with FACT/SF has been performed throughout California, in Portland (Oregon), Seattle (Washington), Sofia (Bulgaria), Belgrade (Serbia), Zagreb (Croatia), Skopje (Macedonia), and in 7 cities across Russia, working with the US Department of State to share contemporary American culture with local Russian communities as part of their ‘American Seasons’ Program. Throughout 2012, Charles was a mentee of Elizabeth Streb as part of CHIME Across Borders at the Margaret Jenkins Dance Lab. Charles graduated with honors from the University of California, Berkeley, with degrees in Dance & Performance Studies and English Literature.